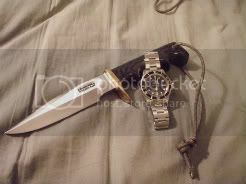 Discussion in 'Other Watch Brands' started by leopardprey, Sep 19, 2011. Tried on again the IWC Mission Earth Ingenieur. Heavy and big watch, but fits my wrist very nice. The way the flat back case is designed, fits on the wrist very nice and the watch stays in place. The rubber strap is very comfy and wraps around the wrist well. Really like the way they did the crown guards. Also a superior proven in-house movement. Had the same movement in my vintage aquatimer I used to have and put through a lot of abuse (and I regret selling!). The 80110 movement is designed to withstand shocks and has the pellaton winding system. Very reliable time wise. Use to have a Ingenieur chronograph, that had an ETA 7750 movement, but again was as great watch and wore for a month long trip traveling through Myanamar. The Ingenieur was made to take abuse and for exploration, plus IMO IWC is a great company. Kind of thinking (Wish I could afford both though) either this one or the 44mm Omega Speedmaster is my next purchase. Like them both about the same. That's a nice looking piece. Bloody big though. What size is it and what do they retail for mate? Is 46mm. But, again, looks much smaller on my wrist, fits just right. I believe the wrist in the photo is like a 6.5" wrist. Porportions are nice, as 15mm thick, but with the size looks very slim. Case back is really flat so sits perfect on my wrist and the rubber strap really wraps around nice the way the strap blends in with the lugs. Stays on the wrist. Actually wears better on the wrist than the 44mm Aquatimers do with the rubber straps. Retail is around $8000 US. But getting quoted prices of around $6800 after discounts here in Thailand and Malaysia. Have seen them on the second hand marker for around $5k. Think you would like Pete, all the photos of the watch with Climbing, exploring, rappelling motives. Not bad, but a tad big for me. 44mm is my limit. What about an Omega or Breitling diver mate? Plenty of options in the big size range and for less money. The Breitling Heritage diver is especially nice. Very nice, but too big for me too. Understand it fits you though. I'd go for the Omega, mate! Love the look but for sure it's not going to fit on my wrist. Tried on the Breitling Heritage Diver, just did not do it for me. Actually, the Omega 44mm is just a tad less in price retail wise and about the same on second hand market. the big thing I like about the IWC is the In-house 80110 movement as I mentioned. A real workhorse of a movement.